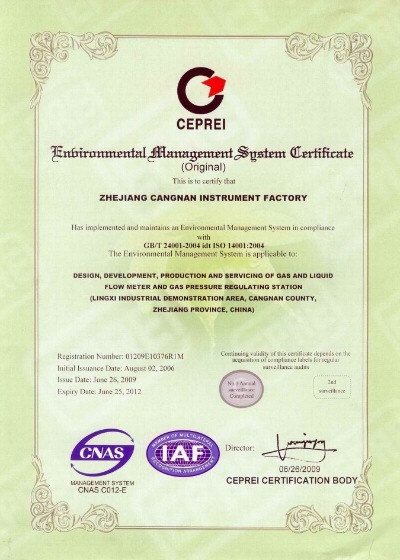 Company Overview - Zhejiang Cangnan Instrument Group Co., Ltd.
14YRSZhejiang Cangnan Instrument Group Co., Ltd.
Zhejiang Cangnan Instrument Factory is high and new tech enterprise manufacturing professional gas meter. We have a site of 40 thousand M, building area is 25 thousand M; sales revenue of 2010 is 215 Million RMB. The factory now has ISO 9001: 2000, ISO 14001:2004.The factory be honored as National pair of love double comments the advanced enterprise, Provincial Family of the national model staff, Provincial establish harmonious labor relationship advanced enterprise, Provincial honest Private owned AAA company, AAA level bank credit company, Zhejiang Green Enterprise, the top 30 of small- and medium-sized enterprises of Wenzhou, mechanical manufacture safety production standardization company of Wenzhou ,model company of Wenzhou ,vitality harmony company of Wenzhou, model industry enterprise of Cangnan, major taxpayer of cangnan ,etc.We have more than 320 staffs of which 35% are skilled technicians engaged in design and development of new products. Our company operates a municipal level R&D center as well as owns advanced production lines, sonic nozzles gas flow standard testing equipment and mechanism centers. Backed by our team of experienced technicians, we can ensure the high quality of all finished products.Our main product series covers industrial meters, domestic meters, gas pressure regulating and flow metering stations, standard gas flow equipment, and long-distance data collecting and monitoring systems. Our five main series include the following products:1) Industrial meters: (intelligent) gas turbine flow meters, (intelligent) swirl flow meters, liquid turbine flow meters, gas roots flow meters, standard throttle devices, gas filters, digital pressure gauges and intelligent electromotor protection equipment2) Domestic meters: diaphragm gas meters, IC card (CPU), diaphragm gas meters and heat energy meters3) Gas pressure regulating and flow metering stations (chests) for high, medium, low pressure4) Standard gas flow equipment5) Long-distance data collecting and monitoring systems: intelligent gas turbine flow meters, gas roots flow meters and IC card diaphragm gas meters Most of products are in the leading position in China and can compare with international level. 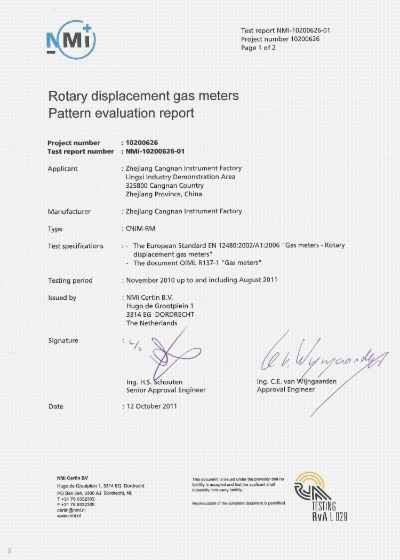 Now we have national creative fund project, 863 nation project, nation torch plan project, nation emphases new product project, Zhejiang province quality overtake project, Zhejiang new product project and innovation plan project, where CNiM-RM series rotary gas meter approved by the European Union (NMi)and get certification. Our products are Zhejiang province famous brand products; 'Dongxing' brand is famous brand of zhejiang province.We keep the guideline of 'Cangnan Instrument at the side of customers, and the customers in the heart of Cangnan Instrument'; establish agencies all over the country, over 40 sales and service net, which forms strong net-service system. 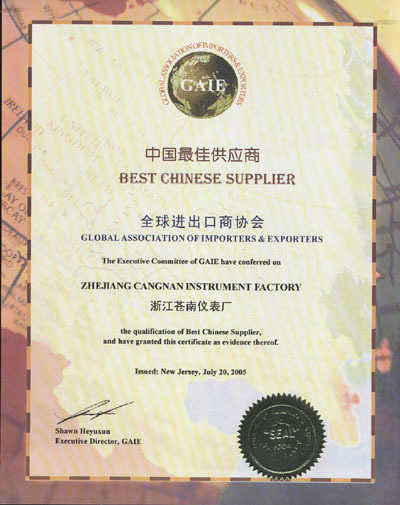 To fine sincerity and pursuit of excellence, all staffs of Zhejiang Cangnan Instrument Factory will sincerely hope to join hands with friends at home and abroad, and create a brilliant. Issued by Global Association of Importers & Exporters. Qualification as Best Chinese Supplier. 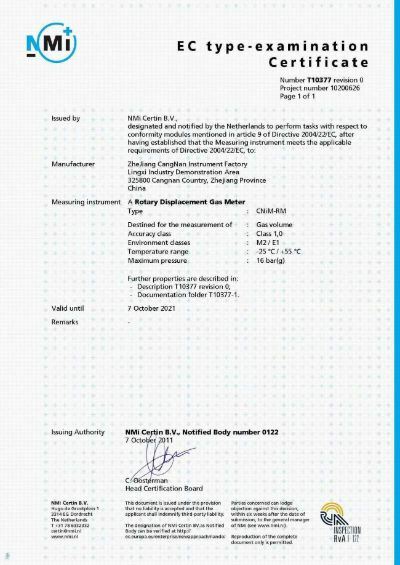 Issued by China Environment United (Beijing) Certification Center Co., Ltd.
Design, development, production and managing the service activity of gas, liquid flow instrument. 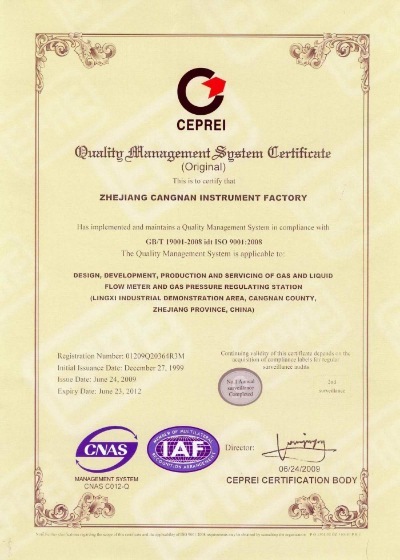 Issued by QCCECC CEPREI Quality System Certification Body. Design, development, production and service of gas and liquid flow meters.